As if anyone needs more evidence of the crate bike’s remarkable utility, we have been informed that the best way for someone on a bike to transport a coffee urn full of piping hot beverage — if not the only way — is with a cratie. [During November’s] Kidical Mass ride, we had a cargo experience that prompted many of us to think of you. I was carrying my kids, four pies, a bunch of other stuff on my bike, so I used my Burley kid trailer to haul a large coffee maker full of hot chai to our destination. It became apparent en route that one of our young riders was tired of pedaling her Piccolo, so I offered my trailer to her dad. Unfortunately, the coffee maker was so large and awkward (and full of hot liquid) that the child and the chai couldn’t both occupy the trailer. We had a sizable fleet of fancy cargo bikes present: 4 Xtracycles, a bakfiets, and at least three kid trailers. 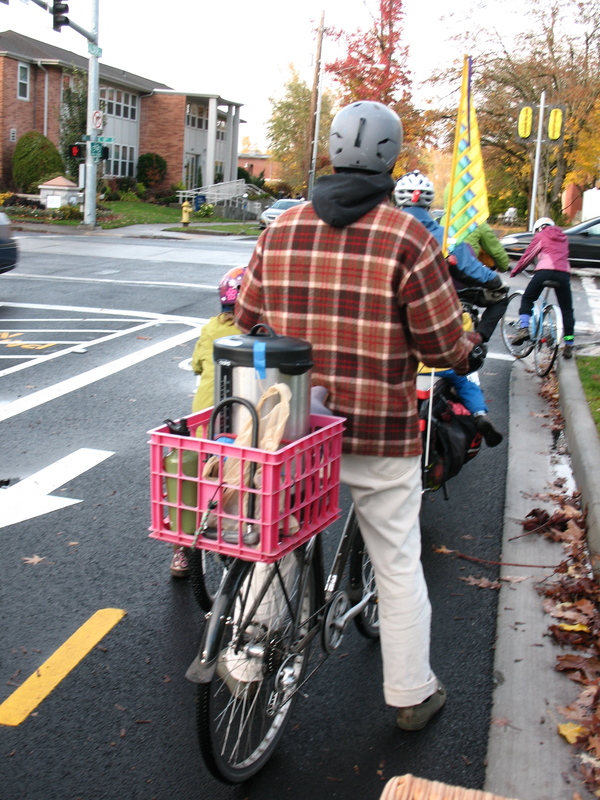 Several of these cargo bicyclists piped up right away, offering to haul the chai. But … we realized that the perfect cargo technology would be: Jon Bilenki’s cratie and some bungees. So, the December Kidical Mass ride is this Saturday (Dec. 17). Kidical Mass is a monthly bike ride around town that is family/kid/chai friendly. I keep meaning to get to one, but something always comes up. Saturday’s ride starts at Monroe Park at 5 p.m. and will wander around checking out holiday lights. It will end at Cozmic Pizza for dinner. Details. Love it! I was one of the xtracyclists who offered (that’s my yellow flag in front of Jon), but the cratie was the clear choice for hot chai, especially as I had my child in tow. I can almost say I miss my cratie days, but really the sulry big dummy kicks some cratie @ss 9 days out of 10…. Yeah, it definitely doesn’t seem right to try to put a kid in a crate.